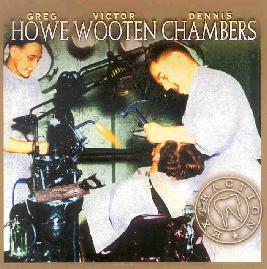 Greg Howe/Victor Wooten/Dennis Chambers - "Extraction"
What a cool gathering of musicians. Victor Wooten from Bela Fleck, Dennis Chambers (Santana, John Scofield, P-Funk), David Cook (on Keys) and Greg Howe. It is good to see someone like Greg making creative jazz fusion music with a healthy dose of funk and soul thrown in instead of wasting his talents touring with the pop bands. At times the non-soloing guitar parts can remind me of some of the stuff from Eric Johnson (Tones era) but this is much heavier and the drumming is amazing and intense. Victor Wooten totally blows me away and the grooves that he and Dennis achieve really fly. Greg's guitar playing is most like Shawn Lane to my ears. Shawn (rest in peace) was a brilliant guitar player and when he played with Jonas Hellborg and Jeff Sipe they could really fly in the same way that these guys do, but here the influence is funkier. David Cook is no slough and lays down some mean lead synth playing as well. A great CD and one that grows over time.